Anthony Anderson had a love of English for as long as he could remember, but it was only after a horrific attack in his own home that he found the strength to pursue his passion for the written word. 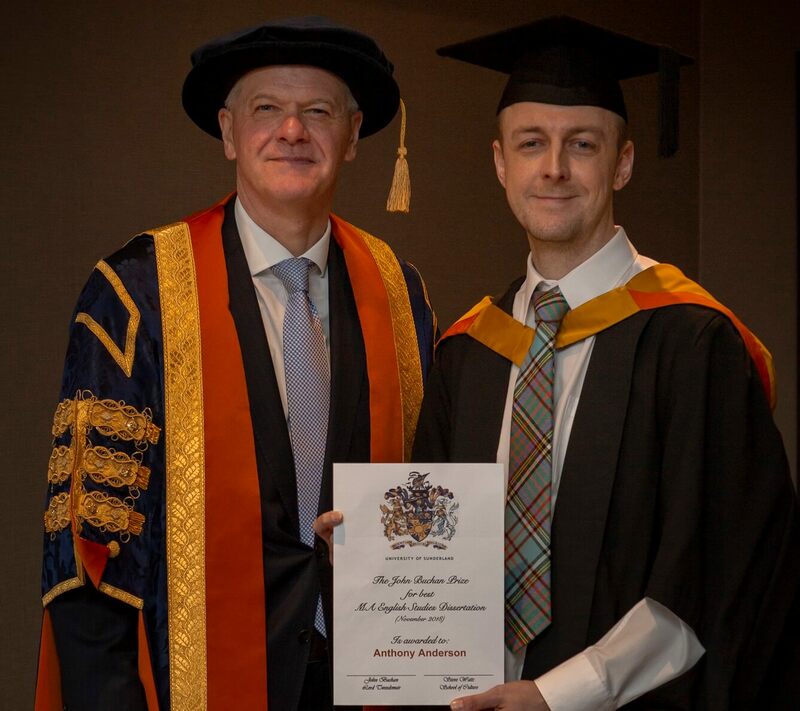 That passion has now led him the stage of the Stadium of Light to collect his English Master’s Degree and pick up the John Buchan Prize for the Best Dissertation by an MA English Student at the University of Sunderland. His lecturers selected his work for the prestigious annual prize for its “exceptional standard” and described him an “incredibly resilient individual and a “real life-changer”. The brutal attack happened in 2010 when the 36-year-old was the victim of a 20 minute assault by a group of men who broke every bone in his face and ransacked his home. It was only emergency surgery which saved him from being deformed for the rest of his life. The men were never caught, and it took Anthony a year to recover from his injuries. He endured months of surgery to rebuild the structure of his face with titanium plates and it was six months before he could eat properly with his weight dropping to just eight stone. He was also made redundant from his managerial role with a national bingo and casino chain. In his words, he says: “It was a pretty rough time for me”. It was while he lay recovering that he thought about how to could take his life forward. His love of English and creative writing had never wavered since his school days, but he admits he made the “wrong” choices in his early days from giving up a place at London’s Royal Academy of Music to completing a History BA degree, before working full-time for 10 years. He decided he would finally take the plunge back into higher education and completed an English and Creative Writing Course with the Open University, all while working full-time. Despite that early wobble, Anthony found university life - and his fellow students of all ages and backgrounds - inspiring, and his grades continued to rise. He also managed to overcome a collapsed lung half way through his first term and had to take a month off to recover. Despite the setback he still managed to achieve an 85 per cent grading for his dissertation. This he based on culturally traumatic events that indelibly marked society from the Holocaust and Slavery right up to the modern #MeToo movement, and how Gothic Science Fiction confronts the patriarchal issues in our society. The work was selected for the John Buchan Prize. John Buchan was a novelist, historian, journalist, politician, soldier and public servant, and is best known for this influential espionage novel, The Thirty-Nine Steps. Anthony was presented with his award at the University’s Winter Academic Awards Ceremonies by John Buchan’s granddaughter, Laura Crackanthorpe. Long term, Anthony, from Washington, wants to eventually teach his beloved English subject, and will begin his PhD next February at the University of Sunderland. The University of Sunderland’s School of Culture has been working closely with the John Buchan Society and John Buchan Story Museum on a number of collaborative projects. These have included the digitisation of the Society's Journal and the redevelopment of the Museum's website. For 2018 the Museum, in Peebles, Scotland, helped create a centenary exhibition on John Buchan, as Minister of Information in the final year of World War One. Steve Watts, Head of the School of Culture, added: “I am delighted with the close collaboration that has been developed with the John Buchan Society and the John Buchan Story Museum. The University has been working on several projects with the Society and Museum to support them in their aim of making their Journal and artefacts available on-line and accessible to everybody. John Buchan (1875-1940) was born in Perth, Scotland. As well as popular fiction, Buchan was also an historian, diplomat and politician. He was Minister of Information from 1917, was elected to Parliament in 1927, and was appointed Governor General of Canada in 1935, where he died, before his ashes were returned to the UK. John Buchan’s most famous work, The Thirty Nine Steps, was first published in 1915, and was an instant success, particularly among soliders in the trenches during World War One. The book has been adapted for film, TV, radio, stage and even as a computer game, and has never been out of print. In 1935 he was given the honour of the First Baron of Tweedsmuir. Tweedsmuir Provincial Park in British Columbia, Canada, was named in his honour.